On Thursday, January 22, 2015, students from the Bridges organization based at New York University sat with local community members in dialogue regarding service. Faiths in Conversation, an event hosted by the Interfaith Center of the Institute for Theological Studies at St Margaret’s, pushed guests to ask themselves what service meant in their faith, what barriers their faith (or personal experience) had to serving people of another faith, and how we could overcome these barriers. Dinner from Taj Mahal restaurant was provided before the dialogue and a kosher meal was served for Jewish participants. 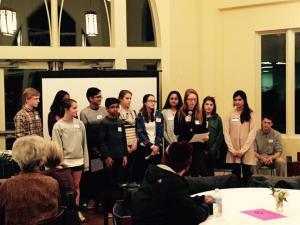 The Multi-Faith Youth Group, a program of the Interfaith Center, took the lead that night with welcoming our guests. The Multi-Faith Youth Group also blessed the food with prayers from the five different faiths represented in the youth group – Hinduism, Buddhism, Christianity, Islam, and Judaism. Representatives from the NYU Bridges Club and from their service host, Jewish Disaster Response Corps (JDRC), spoke about their service that week in Mayflower, Arkansas rebuilding homes. The students spoke about learning about another’s faith, growing in their own faith, and building relationships across faiths through questions and seeing others practice their faith rituals. The Faiths in Conversation guests gained insight into the power of these relationships as exemplified by the NYU Bridges students or by NYU Imam Khalid and NYU Rabbi Sarna documented in the film “Of Many” or by our very own Sophia Said and Rev. Susan Sims Smith. Our guests, including local adults and the NYU students and the Multi-Faith Youth Group teenagers, all left with courage to overcome the fear of taking that first step in a relationship with someone of another faith. Not only were our guests from New York inspired by the interfaith hospitality of Arkansas, but our local guests and teenagers also found inspiration in power of Faiths in Conversation.